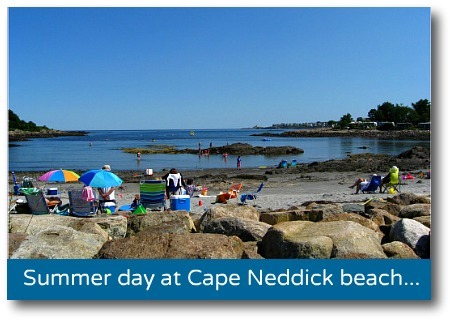 Only one mile north from Short Sands beach, Cape Neddick Maine has the smallest of York's beaches. It sits right at the mouth of the Cape Neddick river. I love the Cape Neddick Maine beach for climbing the rocks and exploring the tide pools with the kids at mid- to low tide, and for the way a low tide recedes far, far away in the distance. At high tide, though, there isn't a beach, but there are some nice rocks to sit on and watch the ocean. Watch the tide chart! Because it's shallow and has big rocks for climbing, this is not the beach if you're looking for waves. But the way the river winds through the beach on its way to the sea, rising and falling with the tide, makes it an always changing, classically Maine, scene. Cape Neddick Maine is also ground zero for watching a time-honored summer tradition; jumping off the bridge into the river. Every summer young people wait till high tide, then take that plunge off the bridge! I asked my friends on York's police force about this activity, and their comment on it was “It's not the brightest thing in the world to do, but it's not illegal”. But it looks like so much fun! There are no bathroom facilities at this beach. There are two small parking areas that each charge $5 or $10 per day: one is directly across from the beach at a brown rental cottage with a sign in front for parking, and for the other lot you pay at the Harborview Campground across from the Cape Neddick Lobster Pound restaurant. Just one more thing – when the tide is low, the water on the non-river side of the Wiggley Bridge on Lilac Lane (Route 103 off of Route 1A in York Harbor) has been basking in the summer sun for several hours. It's warm! Cool ocean temperatures are a fact of life in Maine, and sometimes I would take my babies here to splash around, find snails, and make the Wiggley Bridge wiggle.